The subject of elongated features, defying the laws of gravity and reaching for the sky, has always been of considerable interest to mankind. Why, one may ask. The answer is probably as multifaceted as man itself. It has to do with a mixture of worship, technical skill, power, defense, vanity and in some cases also a practical application of widening the view or drawing attention. The connecting element, from a quadralectic point of view, might be the very multiplicity of interpretation of these ‘sky-high’ structures. All the quadrants have their say in the interpretation and each type of visibility can be present within the communication. The functional aspect of an elongated structure – like a watchtower or a lighthouse – is logical, because the observation is easier and visibility is enhanced. The famous pharos (light-house) in Alexandria (Egypt) does not exist any more, but this structure must have been exceptional and was known as one of the Seven Wonders of the World. The actual appearance is a matter of speculation. There seems to be a three-tiers design with a square base, an octagonal section and a cylindrical section. 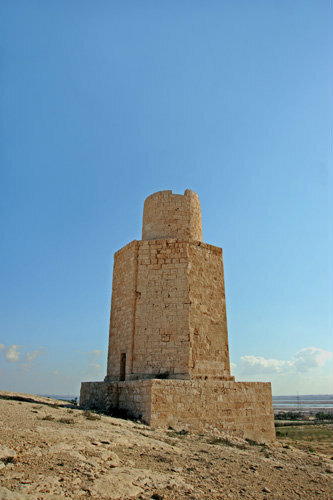 A lighthouse near Taposiris Magna (Abusir), some 45 kilometers west of Alexandria, was built by Ptolemy II Philadelphus and might have been a miniature of the much larger pharos of Alexandria (fig. 466). The latter one, finished in 280 BC, was visualized on a mosaic in the S. Marco Church in Venice, depicted the arriving of the apostle Marcus in Alexandria (fig. 467). Fig. 466 – The lighthouse of Taposiris Magna (Egypt), with a height of thirty meters, is probably a smaller copy of the famous lighthouse of Alexandria on the island of Pharos. Both were completed during the reign of Ptolemy II Philadelphus (282 – 246 BC). Fig. 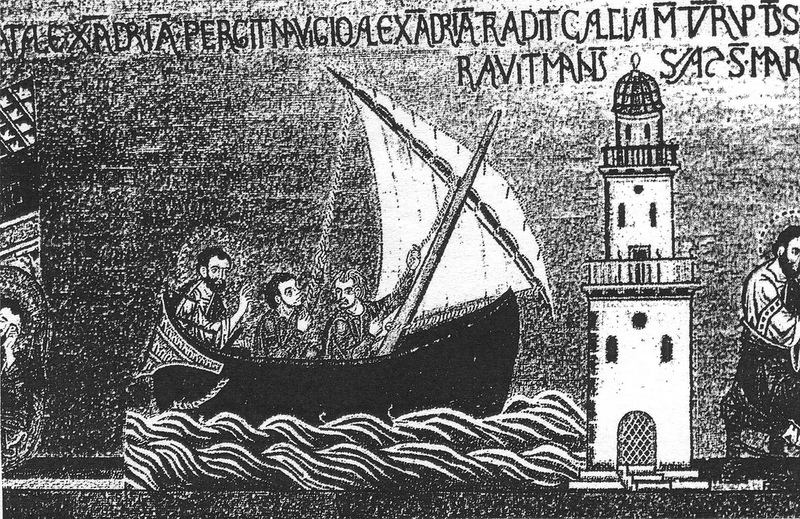 467 – This early representation of the lighthouse of Alexandria (Egypt) is given on a mosaic in the S. Marco Church in Venice. The individual elements of the tower – square, octagonal and round – are not well defined here. More recent illustrations of the lighthouse follow the suggestions of the German archeologist Hermann Thiersch (1874 – 1939) as published in his book ‘Pharos, Antike, Islam und Occident’ (1909). The classical Greek times were familiar with a cone shaped structure, known as the omphalos (navel, center of the earth). The feature had a central place in certain temples, like the one in Delos and at the Apollo temple at Delphi (ROSCHER, 1915). The present example in the museum of Delphi (fig. 468) is a Roman copy. It was mentioned by the Greek traveler and geographer Pausanias, living in the second century AD, in his ‘Description of Greece’. He described ceremonial rites and superstitious customs and mingled legends and folklore. Pausanias had a strong interest in religious art and architecture, in particular in the cultural centres of Olympia and Delphi. Delphi was originally a Mycenaean village from about 1500 to 1000 BC. The inhabitants practiced, according to the earliest legends, the oracular cult of the Earth Goddess Gaia. The emphasis changed around the year 1000 BC to the worship of Apollo. The ancient tradition told how Zeus dispatched two eagles (or ravens), one from the west and one from the east. The birds met at Delphi and a sacred stone was positioned at their meeting point. The oracular use of the site continued and became a flourishing business by the seventh century BC. It was only in the first century AD that the Delphic oracle, for a variety of reasons, went into decline and the last recorded oracle was in 362 AD. The changes in mythological and religious meaning of the Delphi oracle can be viewed in a quadralectic perspective. The sacred place of the earth goddess Gaia (or Ge), protected by her daughter, the serpent Python, seem to point to a Third Quadrant setting (expressed in the visible visibility of the stone). The protection by a snake – with its cyclic connotations – and the oracular nature (including the art of prophecy) points to certain characteristics of the Fourth Quadrant. The power of prediction can only flourish in multiple division thinking. The mythological story of the two birds, coming from two directions, is – on the other hand – a distinct lower-division motif. The interpretation as the ‘center of the earth’ is a further hind to unity, either as a visible entity in the Third Quadrant – as an omphalos – or as an invisible object of worship (Apollo, the son of Zeus) in the First Quadrant. The archaic accounts of the priestesses of Delphi, known as Pythia, sitting in a chair over a fissure in the earth from which trance-inducing vapors emanated, could be a symbolization of the insight gained in the Fourth Quadrant. The nearby round Tholos Temple in the sanctuary of Athena Pronaia (see also p. 96ff) might be an architectonic expression of that position. Fig. 468 – An omphalos (navel, ‘belly-button’) as found in Delphi and thought to be a replacement of the original omphalos in the Apollo temple. The position in the center of the inner sanctum (adyton) of the shrine of the Delphic oracle pointed to a symbol of unity, where everything is in everything. The obelisk is another architectonic feature with its own history as a marker point in a communication. The Egyptians called the structure ‘tejen’, meaning a form of ‘protection’ or ‘defense’. The obelisks were erected in pairs and placed near the entrances of temples. The Greek word ‘obeliskos’ points to a prong for roasting. Most stones were monolithic and quadrangular. The obelisk in Urbino (Italy) – dating from the 26th Dynasty – is a notable exception and is an octagon. At present, there are about thirty ‘authentic’ obelisks in existence of which seven are still in Egypt and thirteen in Rome. The rest (ten) is scattered around the world in places like New York, London, Wimborne (England), Paris, Arles, Florence, Urbino, Catania (Sicily), Istanbul and Caesarea (Israel). The obelisk was mentioned in its Egyptian context as a symbol of the sun in the city of Heliopolis. It was connected in the predynastic times with the worship of the sun god Re, but also in the funerary practices of the later stages of the Egyptian cultural history. Another concentration of obelisks was found in the Temple of Karnak (near Luxor, Egypt). Most of them were erected in the 18th and 19th Dynasties, at the beginning of the New Kingdom (1550 – 1070 BC). The temple in Thebes (or Karnak) is, in fact, a large composite of buildings, consisting of the main temples of Mut, Monthu and Amun-Re and a number of smaller ones, which were built and extended over a period of some thirteen hundred years. The obelisk situated at a court after the third pylon of the Temple of Amun-Re was erected by Thutmosis I (1504 – 1492 BC). It was twenty-one meters tall and still bears its original inscriptions. The nearby obelisk of Hatshepsut (18th Dyn, 1498 – 1483 BC) has a height of 29.6 meters and weighs around three-hundred-and twenty tonnes (fig. 469). It is, after the Lateran obelisk in Rome, the largest standing obelisk. Fig. 469 – The obelisk of Hashepsut in the Temple of Amun-Re in Karnak. The obelisk reached again for importance in the (late) Renaissance where its function as a marker point got a new lease of life. The Franciscan Pope Sixtus V (1521 – 1590; fig. 470) started in 1585 with the improvement and expansion of the streets and squares in Rome in a large building project. Fig. 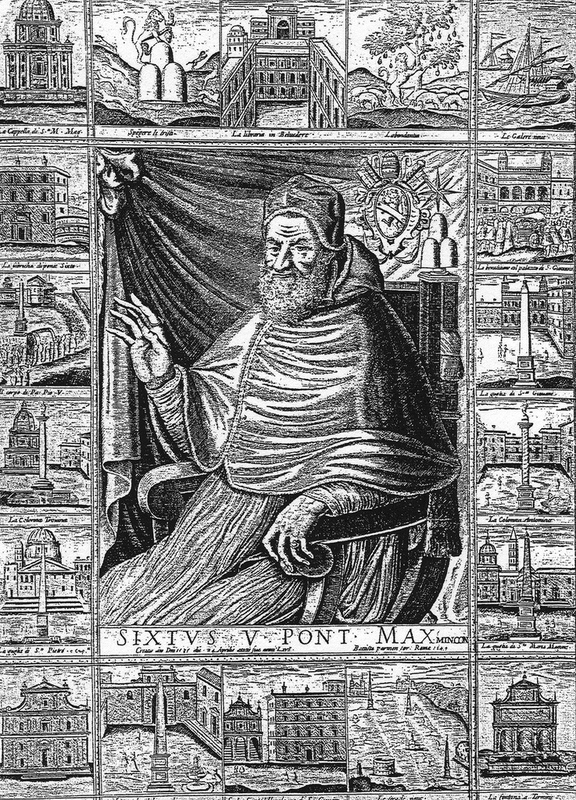 470 – Pope Sixtus V (1521 – 1590) made his name as a (re) builder of Rome. He wanted to establish the city as the center of power of the Roman Catholic Church. 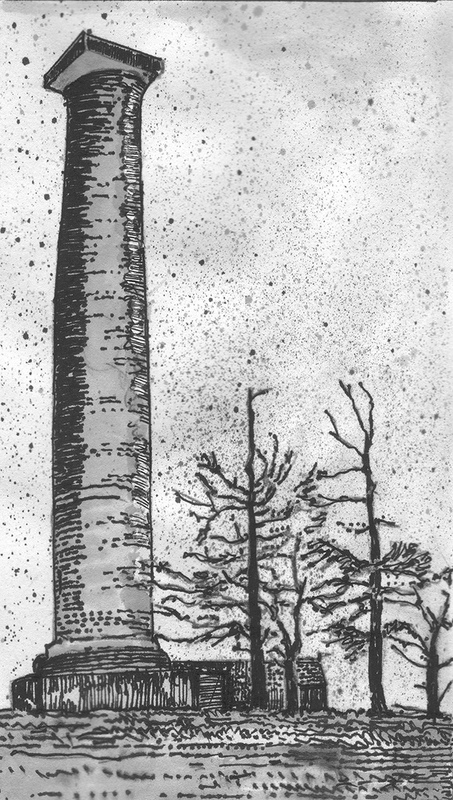 Some of his projects – like the positioning of obelisks – are given in separate illustrations. Sixtus V worked in the tradition of Pope Martin V (1417 – 1431), who also tried to prepare the city for its more important function as a metropolis for pilgrims. Martin V introduced new legislation, which was further extended by Nikolaus V (1447 – 1455), Sixtus IV (1471 – 1484) and Gregory XIII (1572 – 1585). Pope Sixtus V ruled only for five years (1585 – 1590; DUFFY, 1997), but was probably the pope with the most oppositional mind. ‘He combined the rigid morality of his puritan contemporaries with the pitilessness of the Catholic inquisitors’ (GIEDION; 1941/1967). to make up seven. This figure had only numerological significance as a mysterium numeri. SCHIFFMANN (1985, p. 113) quoted Panvivio (1570) by saying that the four patriarch residences represent ‘keiner Zahlensymbolik’ (no numerological value). However, it was reckoned to be of prime impor-tance that all of churches should have an obelisk in front of them. Sixtus’ V projects were a major rejunovation of the city since its days of glory, and he made a great effort to turn Rome into ‘a single holy shrine’, for which he used old Roman columns and Egyptian obelisks to mark the pivotal points in his new city plan (SCHIFFMANN, 1985). The transportation of Vatican obelisk to the S. Peter’s Square was a great act of engineering. Originally, the piece of rock was carved during the reign of Amenemhet II (1992 – 1985 B.C.) and stood before the Temple of the Sun at Heliopolis (see p. 104). It is the only obelisk in Rome in which no inscriptions were made. The writer Pliny the Elder (23 – 79 AD) noted in his book ‘Naturalis Historia’ (Natural History) that the monument was shipped to Rome by the Roman emperor Caligula in 37 A.D., as token of his conquest of Egypt. It was first positioned at the spina (central reservation) of the Circus of Caligula and later at the Circus of Nero. 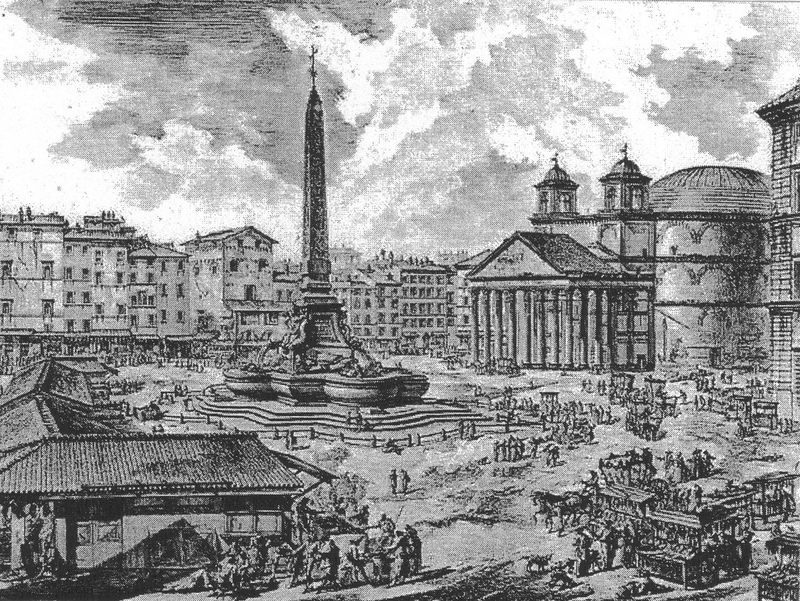 The obelisk – weighting three-hundred-and-twenty tons and twenty-five meters tall – was moved over a distance of two-hundred-and-fifty meters from the old sacristy of St Peter (Circus of Nero) to the St Peter Square (fig. 471). Fig. 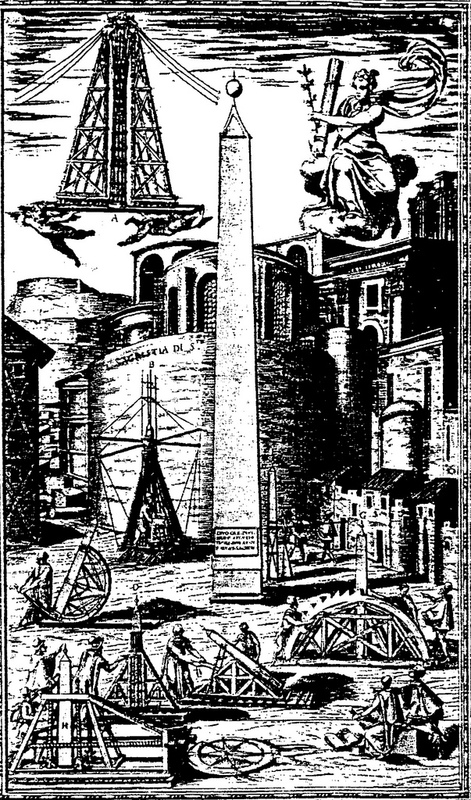 471 – The Vatican obelisk of St. Peter’s square in its original position at the Circus of Nero and some of the instruments to move the object. The description of the transportation is given in a publication by Dominico Fontana (1590) with copper plates by Natale Bonifazio da Selenico. This tour de force was performed by Pope Sixtus’ chief engineer Domenico Fontana (1543 – 1607), nine hundred laborers, hundred and fifty horses and forty-seven ropes. He reported on this technical masterpiece in a publication called ‘Della trasportatione dell’ obelisco Vaticano et dell fabriche di Nostro Signore Papa Sisto V’ (1590). Fontana’s operation was admirable, but it also brings to mind the efforts of the Egyptians, who created the obelisks in the first place, and secondly the Romans, who later transported the massive rocks to Rome. The Egyptian obelisk at the square of St. John Lateran (Piazza San Giovanni in Laterano) is the largest in existence, with a height of thirty-two meters. It dated from the reign of Thutmoses III (1502/1479 – 1425 B.C.) and stood in the temple of Amon in Thebes (Karnak). It was removed by Emperor Constantius II (317 – 361 AD) and placed at the Circus Maximus in 357. The last great Roman historian, the writer Ammianus Marcellinus (fourth century AD) described the construction of a large boat, with three hundred rowers, to transport the obelisk to Italy. The obelisk was later damaged in an earthquake and buried by rubble. However, it was dug out in the rebuilding program of Sixtus V and subsequently repaired (in 1587). The obelisk was placed on the Piazza S. Giovanni in Laterano, again by the engineer Domenico Fontana. The obelisk Flaminio at the Piazza del Popolo is with its 23.9 meters also one of the tallest obelisks in Rome. Originally, the obelisk was positioned in the Sun Temple in Heliopolis (Egypt). Three sides of the obelisk were decorated during the reign of Seti I (‘the one who fills Heliopolis with obelisks that their rays may illuminate the Temple of Re’) and his son Ramses II carved the fourth side. Octavianus, the first Roman Emperor Augustus brought the obelisk as a trophy to Rome, after the conquest of Egypt in 31 BC. The monument was then erected at the spina of the Circus Maximus in 10 BC. Domenico Fontana subsequently placed the obelisk at the Piazza del Popolo in 1589. The renovation of the Popolo Square in the early nineteenth century (1816 – 1824) became the masterwork of the architect and urban planner Giuseppe Valadier (1762 – 1839), who was also involved the layout of Fiumicino, the first planned suburb of modern Rome, and the restoration of the Arch of Titus. He positioned the obelisk in two half-circles and added four fountains with lions. More tetradic imagery was added by the statues of the four seasons at the foot of the Pincio Hill on the road to the Tiber. The obelisk Solare (the sun obelisk) is another large monument (21.8 m) at the Piazza Montecitorio (Piazza del Parlamento) in Rome. The obelisk was derived – just like his Vatican and Flaminian counterparts – from Heliopolis where it was originally erected by Pharaoh Psammetichus II, the third ruler of the 26th or Saite Dynasty (595 – 589 BC). The obelisk was brought to Rome together with the Flaminian obelisk. Its original function was relived during the reign of Emperor Augustus, when it was placed at the Campo Marzio (Mars Field) and acted as a gnomon for a sundial. The obelisk was found again in the sixteenth century, but reburied. Its rediscovery took place in 1748, in the same year when the excavation of the ash-covered city of Pompeii started. 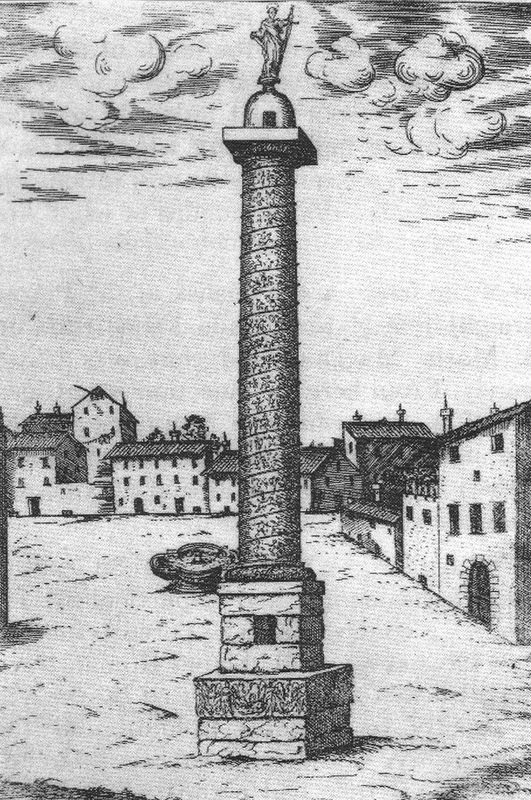 The present position for the Solare Obelisk was reached under Pope Pius VI in 1792, using some of the material of the destroyed triumphal column of Antonius Pius. The obelisk at the Piazza della Rotonda in Rome (see also fig. 92) also came from the above-mentioned Temple of Isis at the Campo Marzio and was unearthed in 1575. The six meter high structure was originally placed in front of the San Ignacio Church at the Piazza di S. Macuto. Pope Clemens XI (papacy 1700 -1721) moved the obelisk in 1711 to its present position in front of the Pantheon. An engraving by Piranesi, known from his ‘Antichita Romane’ (1748 – 1756), shows the thriving city life at the middle of the eighteenth century (fig. 472). Fig. 472 – This scene (veduta) of the Piazza della Rotonda around 1751 was given by Piranesi. Pope Clemens XI placed the obelisk in front of the Pantheon in 1711. The obelisk Agonalis (or obelisk of Pamphilia) at the Piazza Navona is sixteenth-and-a-half meter high and part of Bernini’s ‘Fountain of the Four Rivers’ (see fig. 35). A description at the base of the obelisk says that the Roman emperor Caracalla brought the original monument to Rome. It was in fact locally made for the Temple of Isis during the reign of Domitian (see fig. 88). The hieroglyphic inscriptions celebrated the emperor and his Flavian family and was the first to be used on a public monument outside Egypt (IVERSEN, 1961). Emperor Maxentius (c. 278 – 312) moved the obelisk in the beginning of the fourth century to his Circus at the Via Appia. Pope Innocence X organized the transportation to the present position of the obelisk at the Piazza Navona in 1649. The German Jesuit scholar and natural philosopher Athanasius Kircher (1602 – 1680) described the obelisk – in his book Obeliscus Pamphilius (1650) – as the digitus solis or ‘finger of the sun’. He was an authority on the mysteries of Ancient Egypt and was actively involved in the erection of obelisks on Roman squares. His ‘translation’ of the hieroglyphs was an illusion. The real understanding of the language had to wait until the discovery of the Stone of Rosette in 1799 (with the same text in three different languages: hieroglyphic, demotic and classical Greek) and its subsequent translation in 1822 by the French archaeologist Jean-François Champollion (1790 – 1832). The smallest obelisk of Rome (5.47 meter) is part of a curious monumental work by Bernini. The Minerveo obelisk from red granite came from the city of Sais (see p. 105), where the above-mentioned Pharaoh Psammetich II erected it around 590 BC. More than two thousand years later it was found in the garden of the Santa Maria sopra Minerva Cloister in Rome. Pope Alexander VII gave Gianlorenzo Bernini (1598 – 1680) the task to bring the monument to new glory and the artist opted to place the obelisk on the back of an elephant. His inspiration was probably derived from the ‘Hypnerotomachia Poliphili’ (Poliphilo’s dream-fight with Eros) by Francesco Colonna (or Alberti?). This book contained a woodcut of an elephant carrying an obelisk. The manuscript was completed in 1467 and the book became an instant success when it was published by the humanist Aldus Manutius (1449 – 1515) in Venice in 1499. The elephant had a long history in the Greek and Roman antiquity as part of the army (SCULLARD, 1974), but its (re)appearance as a monumental element was quite revolutionary. The Catania obelisk at the Piazza del Duomo in Catania (Sicily) is part of the Fontana dell’Elefante (Elephant Fountain) and consists of an obelisk fixed to the back of an elephant. The city of Catania was historically connected with the elephant, known from Carthaginian invaders, Pyrrhus’ army and their own rearing of pigmy elephants. The material of the obelisk is derived from the red granites of Aswan, but further information of its history is lacking. It was presumably brought to the Sicilian city during the Roman Era (30 BC) and was assembled by the Palermo-born architect Giovanni Battista Vaccarini (1702 – 1768) in 1736. It is certain that the above-mentioned Minerva obelisk by Bernini was used as a model. The interesting stories in connection with obelisks will not be further pursued here. The number of ‘authentic’ obelisks might be limited to thirty, but their followers up to the present day are many. The large ‘new’ obelisks in North America (Washington, Charlestown, MA, Sussex, NJ, Buffalo, NY, Hawaii) and South America (Buenos Aires, Caracas, Montevideo, Campina Grande) are creations in their own right, pointing to a national conscious. 1. The initial manufacturing of the objects in Egypt, associated with a genuine (sun)worship. The moments of eminence within the Egyptian cultural period were in the Middle (Amenemhet II (1992 – 1985 B.C.) and New Kingdom (Thutmosis III (1502/1479 – 1425 B.C.) and in the Late Period/Saite Dynasty (Heliopolis). 2. The transportation from Egypt to Rome during the early years of the Roman Empire as part of a replica-worship. This act of movement lies in a time span between the emperors Augustus and Constantius II, i.e. between the first and fourth century AD. 3. A renewed interest during the Contra-Reformation, in particular Pope Sixtus V (1585). He used the obelisk as an instrument in a new city design and as a tool to underline his power. 4. An appreciation as a memorial and funerary object during the Neo-classical period in the European cultural period. One – of the many – examples is the etching ‘The Heroes’ Last Rendez-Vous (fig. 473), aiming at an evocation of feelings associated with bygone days. These points of recognition (POR) seem to follow a complete quadralectic cycle. The initial creation in Egyptian antiquity in a context of devotion took place in the First Quadrant (I). The subsequent movement into a sphere of (non-religious) ideas about visibility belong to the Second Quadrant (II). The position of the obelisk as a powerful means of direction is situated in the Third Quadrant (III). Its spiritual function (again), joining the diffuse feelings of the previous settings together, has the character of the Fourth Quadrant (IV). These stages should be remembered when an obelisk is valuated as a historical phenomenon. Fig. 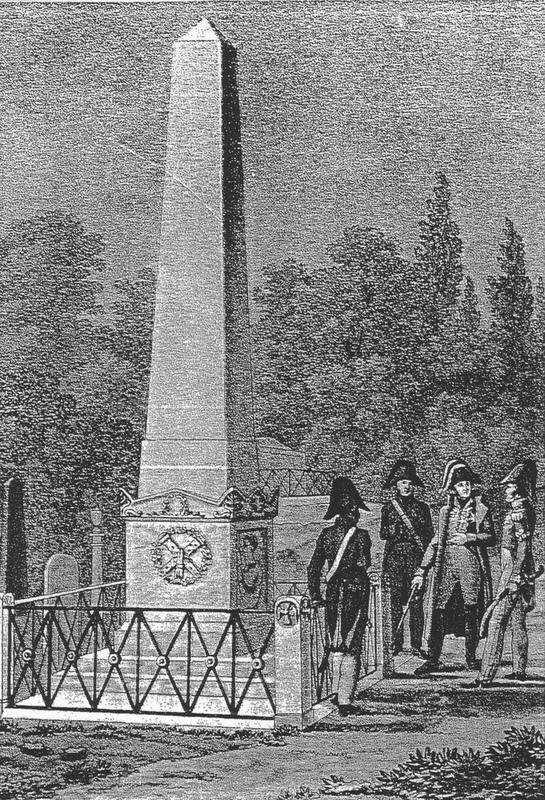 473 – The obelisk as a funerary monument is seen here in a ‘Heroes’ Last Rendez-vous’ when Maréchal Lefebvre (1755 – 1820) selects his final resting place accompanied by Maréchal Masséna (‘l’enfant chéri de la Victoire’) during the funeral of General Collaud, November 11, 1819. These gentlemen made their name and fame in the French Revolution and the armed conquest of Europe, which followed under the leadership of Napoleon I. The etching is derived from Marchant de Beaumont’s ‘Vues pittoresque’, 1821. The latter author also produced travel books (‘Le nouveau conducteur de l’étranger a Paris’, 1816) and a morbid ‘Manuel et itinéraire du curieux dans le cimetière du Père-Lachaise, ou coup d’œil sur son histoire au temps des Jésuites’ (1817). The triumphal column was probably a more genuine Roman achievement – in comparison to the stolen Egyptian obelisks. The Roman columns had been very little to do with sun worship or otherwise, but was a monument in its pure sense – recalling the act of heroism of a particular person. Alfonso Chacon gave in his book ‘Historia utriusque belli Dacici a Traiano Caesare gesti ex simulachris quae in columna ejusdem Romae visuntur collecta’ (Rome, 1576) a suite of engravings of Trajan’s column at the Piazza Colonna in Rome. The plates for the engravings are the work of Raphael and his pupils Giulio Romano and Giovanni Polydoro (fig. 474). Fig. 474 – The Antonine Column is shown here with the early outlines of the Piazza Colonna in Rome, 1588. The triumphal column is a Roman expression of power and glory. Trajan’s column was erected in 114 AD to commemorate the victory against the Dacians and a spiral band contains over two-hundred meters of bas-reliefs with scenes from the campaigns. The Column of Marcus Aurelius, on the Piazza Colonna in front of Palazzo Chigi in Rome, was modeled after Trajan’s Column. The original dedicatory inscriptions were lost, but the triumph over the Teutons in 176 AD must have given the occasion. The column was completed in 193 AD. The shaft is twenty-nine meters long and stands on a ten meter high base. A stairway of nearly two hundred steps leads inside the marble blocks to a platform at the top. The statue of Marcus Aurelius had disappeared in the Middle Ages, when the monument was a popular spot for visitors. The triumphal column continued its march through history, but never to the artistic qualities of these early examples. The column of Phocas, as one of the last additions to the Forum Romanum, was erected in 608 AD in honor of the Byzantine emperor Phocas. Adjunct professor of art history Steven Wander (at the University of Connecticut) studied a sheepskin scroll, the so-called Joshua Roll, at the Vatican Library, which might have been the layout for a triumphal column. The drawings have a ten-degree slant, suggesting that the drawings were intended to spiral around a column. The presumed date of the tenth century suggests that the concept of a triumphal column was still alive at that time. The period of ‘revival’ only set in with the rediscovery of the classical (Greek and Roman) past in the Renaissance, starting in the early fourteenth century in Italy. The triumphal column at the Palazzo Communale (Volto del Cavallo) in Ferrara was made by Alberti in 1451 and marked a period of renewed attention to this particular feature. The Neoclassicistic period (1750 – 1850) was even more concerned with anything ‘classical’. The (triumphal) column participated in that interest. Fig. 475 – Keppel’s Column at Wentworth Woodhouse (England) was assembled by John Carr in 1782. The thirty-five meters high Keppel’s Column (fig. 475) is part of a group of follies on the grounds of Wentworth Woodhouse, near Rotherham (South Yorkshire, England). The area also features the Marker Obelisk (between the House and Wentworth Castle), the castellated Steeple Lodge (which looks like a church), Hoober Stand (a thirty meters high tapering pyramid with a hexagonal lantern; 1748) and an ingeneous hollowed pyramid, called the Needle’s Eye (1780). Keppel’s Column was dedicated to Admiral Keppel. He was court-martialed and accused of misconduct and neglect in the (First) Battle of Ushant in 1778, fought between the French and British navy west of Ushant, an island in the English Channel. The division line between a triumphal column as an urban monument and a (rural) folly (see also chapter 3.9.4) became increasingly more vague from the late eighteenth century onwards. The Washington Monument by Robert Mills (1781 – 1855) in Washington D.C. (USA) provides a story of tetradic building in its own right. Mills was the first architect, who was born and trained in America. He went to Washington at the age of nineteen and worked for James Hoban, who directed the construction of the White House and the Capitol. Later he worked for Benjamin H. Latrobe from 1803 until 1809 and started his own commissions by 1810. The Monumental Church in Richmond (Virginia) was his first major achievement. The building had an octagonal plan and a saucer dome with a Doric porch. Mills’s initial strongly tetradic concept for a statue of Washington (submitted in November 1813) was columnar in nature with ‘an octagonal column divided into four levels’, with four trophies of victory on each corner of the base and crowned by a quadriga driven by George Washington (1732 – 1799), who was the first president of the United States from 1789 – 1797. This design was not received favorably, and described by critics (like Maximilian Godefroy) as the pagoda of ‘Bob the Small’. The column and its ornamentation went through numerous permutations. A statue of George Washington substituted the quadriga, the symbol of tetradic thinking, and a cast-iron fence replaced the projected figural sculpture. The final design resembled closely the Austerlitz Column at Place Ven-dome in Paris, designed by Denon, Gondouin and Lepere in 1810. The initial idea was derived from Trajan’s Column in Rome (113 AD). By 1825 the column had reached its highest point at forty-nine meters and was at that time the tallest column in the world. In 1829 the 14-foot marble statue of Washington was raised to the summit and the final block of the four-part statue was put in place on November 25, 1829 during a grand ceremony. The building of the Alexander Column at the Palace Square of St. Peters-burg (Russia) took place just after (1830-1834) the completion of the Washington Column. It was described in Montferrand’s book ‘Plan and Details of the Memorial Monument Dedicated to Alexander’ (Paris, 1836). The concept of a tall, monumental structure has kept the imagination of mankind from its early presence, but found a distinct culmination in modern times. The Eiffel Tower in Paris (France) set the pace at the end of the nineteenth century (1889), with a tetradic structure in steel to a height of 324 meters. The Empire State Building in New York (‘the quadrifaced pharos of the city’) put in its bit (381 meters) and was the tallest building between 1931 and 1972, when it was surpassed by the World Trade Center (417 meters). Then the Sears Tower (442 meters) in Chicago took over and the CN Tower in Toronto (Canada) held the ‘record’ of the tallest building for a long time (since 1976) with a height of 553 meters. However, extremely tall buildings sprung up all over the world towards the end of the twentieth centuries, with an emphasis on the Asian (development) countries. The Petronas Towers in Kuala Lumpur (Malaysia) (1998; 452 meters fig. 476) and the ‘Taipei 101’ Tower in Taiwan (2004; 508 meters) are only a few examples of that part of the world. The Burj Dubai (Dubai Tower; United Arab Emirates) reached 818 meters in 2010. It is fair to assume that the intentions of the decision makers and builders to reach these heights were the same as during the erection of triumphal columns in classical times, i.e. a search and underlining of identity and a subsequent pride. Any new tall building has to be placed in a cultural setting where (visible) visibility is of prime importance. Fig. 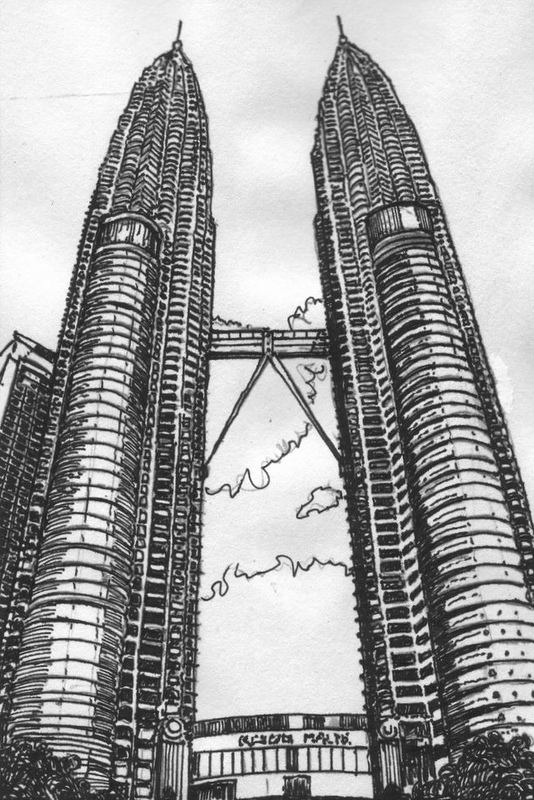 476 – The Petronas Towers in Kuala Lumpur (Malaysia), completed in 1998 reaching a height of 452 meters, is one of the extreme tall buildings, which sprung up in the Middle and Far East. It is a wry observation that once the churches had the prerogative to reach for ever greater heights in their buildings, but now it is the new religion of consumerism and mobility, which make oil companies spend their money on such features. 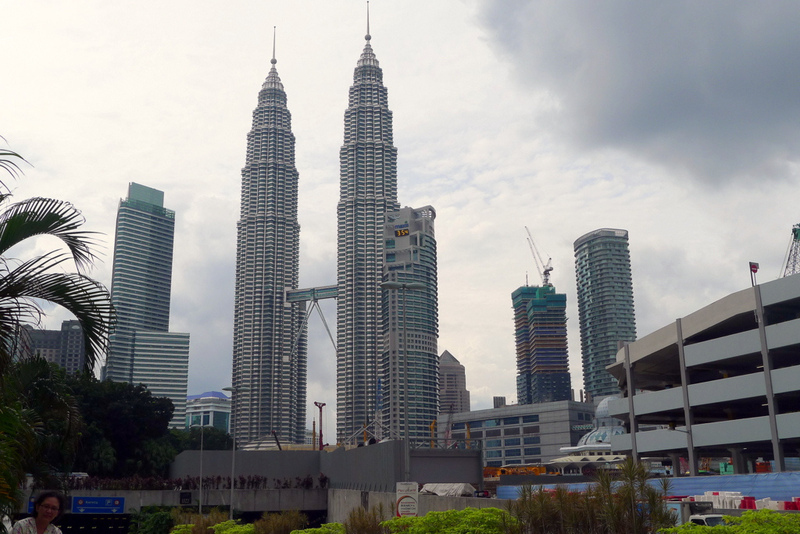 The Petronas Towers in Kuala Lumpur (Malaysia) (Photo: Marten Kuilman, Nov. 2013). The complete destruction of the Twin Towers in New York, on the eleventh of September 2001, could be seen as a symbolic destruction of a ‘dualistic’ structure by people, who are obsessed by the two-fold. The use of four planes to fly into buildings of ‘power’ is the bizarre result of a consequent application of oppositional thinking. This act of terrorism can be interpreted as an effort to destroy the symbols of the Third Quadrant, made visible in economic power (Twin Towers), military power (Pentagon) and political power (White House). The latter building was not reached, because the plane crashed in Pennsylvania due to the intervention of its passengers. The inescapable truth in the framework of oppositional thinking is either a full dedication or no dedication at all. This means, in terms of a particular goal in life, that every effort and activity will have to contribute to that single objective. A dangerous psychological mixture comes into being when a religious (monotheistic) component is added to the oppositional setting, often combined with an order to submission – like the (extreme) Islam and certain (Christian) sects proclaim. It means that higher division thinking and the relativity of belief and knowledge does not get a chance to develop. This road could lead in due course – according to the same laws of antagonism – to self-destruction. The frequent occurrence of this type of thinking and its consequences is still a major component in the political events of the Middle East. The pillar or column is the more institutionalized version of ‘the upright’ within an architectonic concept. An interest in this particular feature is fed by the basic (quadralectic) notions of division and movement, which are represented in this elementary form. The ‘vertical’ is a distinct choice, which is – in a dualistic context – opposite to the ‘horizontal’. Pillars and columns point upwards and are associated with ultimate space (the realm of the gods, the First Quadrant) and limited space (material support, the Third Quadrant). George HERSEY (1988) drew attention, in his book on the lost meaning of classical architecture, to the connection between a trope (association), a trophy (a point of tide turned) and a temple as an architectural token of sacrifice. The Egyptians first ventured the feature as early as the third millennium BC. The temple complex of Djoser, with the Step Pyramid, showed the fluted column in its enclosure and there is also evidence of ‘pillaring’ within a wall, being a form of decoration. 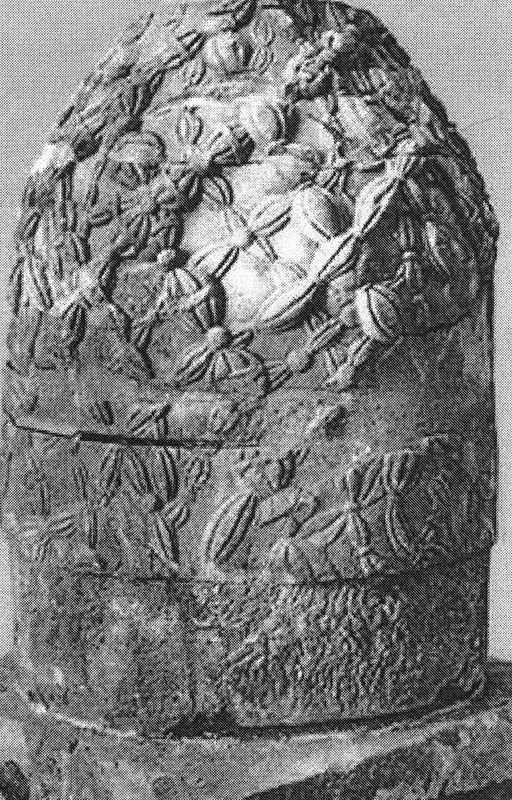 The palmiform column was another early form found in the mortuary complex of Unas (5th Dynasty). The closed (bud) style of columns in the Hypostyle Hall in the Temple of Amon in Karnak (Egypt) is considered the zenith of column building (fig. 477). 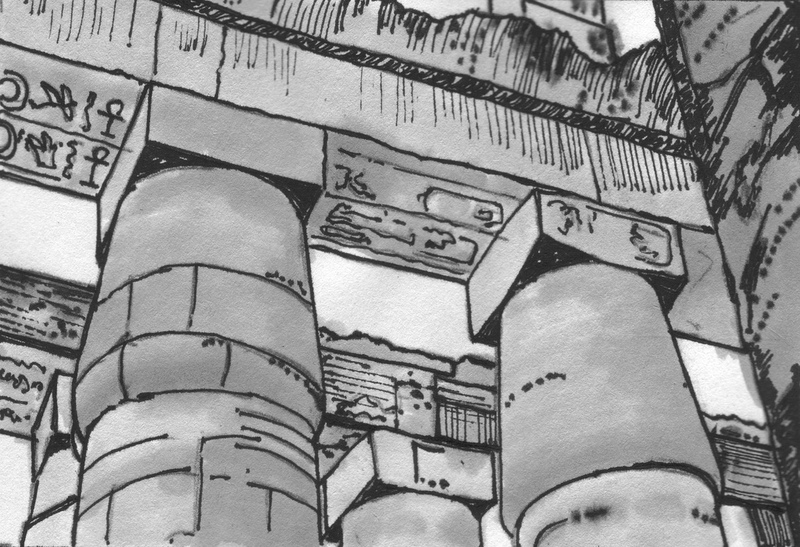 Some thirty different forms of columns are known in Egyptian architecture. Fig. 477 – The columns in the Hypostyle Hall of the Temple of Amun-Re in Karnak are gigantic. Ramses I and Seti I made in this building a tribute to power and multiplicity. The construction of the Hypostyle Hall started during the reign of Ramses I at the beginning of the Nineteenth Dynasty and was continued by Seti I (1306 – 1290 BC). The hall measures hundred-and-forty by seventy-five meters and its original roof must have been twenty-one meters high. Only twelve of a total of hundred-and-thirty-four columns reached the full height. The historical position of the building is towards the very end of the Third Quadrant (2320 – 1280 BC) of the Egyptian cultural period. It can be seen as a statement, which opened up new ways into the realm of higher division thinking of the Fourth Quadrant (1280 – 240 BC). The column had a pivotal position in the architectural projects of the Achaemenian rulers at Persepolis (Takht-E Jamshid, Iran). The Apadana (or Audience Hall) of the temple complex is called the ‘Palace of Hundred Columns’ and was used by Darius I for receptions and meetings with his army commanders. He ruled from 522 to 486 BC and was succeeded by Xerxes. Some sixteen of the twenty-meters high columns are still standing and give an impression of the exceptional size of these ancient ‘sky-scrapers’. Also the enormous eagle and bull figures, which were made to top columns, cannot fail to impress the modern observer. The pillar as a pronounced element in an architectonic concept really took off in the cultural history of Greece. The Greek temple became, more or less, synonym with pillars in a great variety of numbers, positions and shapes. The history of the different ‘orders’ might be related to the four-division of the original population of Greece: the Dorians, the Aeolians, the Ionians and the Achaeans. The Doric column emerged not later than the seventh century BC and all the characteristics were present in a single structure around 575 B.C. (BERLETTA, 2001). The earliest examples are from the sanctuary of Hera at Argos and the twelve capitals from the Temple of Athena Pronaia at Delphi. The dating of the latter is still a matter of scientific dispute – from the second quarter of the sixth century to the second half of the fourth century. Fig. 478 – The Erechtheum on the Acropolis of Athens (Greece). The Porch of the Maidens has four women in the front row and two in the back row, supporting an Ionic entablature. 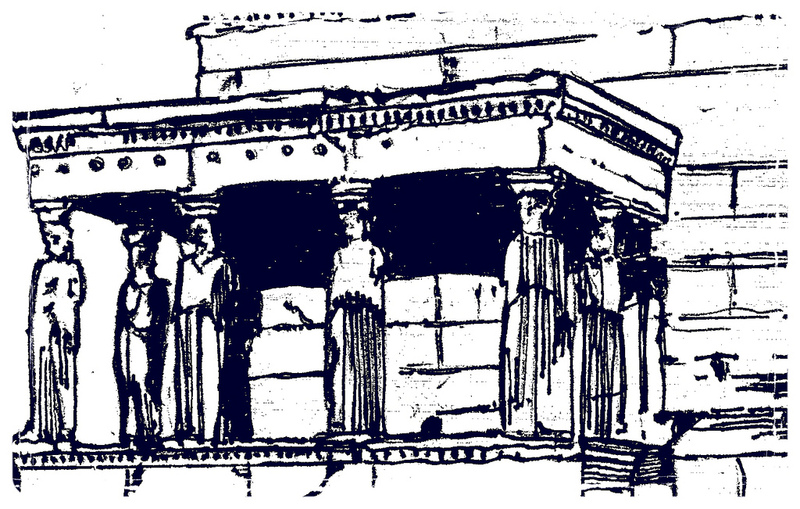 The Caryatid portico (Porch of the Maidens) of the Erechtheum at the Athenian acropolis might hold a clue in the history of pillars-in-general (HERSEY, 1988). The well-preserved building, constructed over the tomb of the mythical king Erechtheus, dated from 421 B.C. (fig. 478). The statue-columns were unusual for the period. Normally, the Greek statue-columns came in pairs, flanking entrances, but the Erechtheum has six maidens acting as pillars, four in the first row and two in the second row. The Caryatid portico, as the group was also known, points to the city of Caryae in Laconia (situated in southern Greece, Peloponnesos) and to Carya, the daughter of King Dion of Laconia, who had refused the love of Dionysus. The Ionic entablature found its home ground in Ionia, the area in south western Turkey, where the Meander River drains in the Aegean Sea. The area had been a melting pot of eastern (Persian) and western (Greek) influences during the fifth century BC in much the same way as Alexandria (Egypt) hold that position in Hellenistic times (first/second century AD). A speculation of a ‘victory’ of the four-fold over the two-fold in this area (Ionia) is not far fetched when the mental situation of this Greek colony (in the fifth century B.C.) is taken into account. A reference to a number of Ionian philosophers, like Empedocles, and their particular way of thinking, was given earlier in this book. Vitruvius mentioned other myths of the maidens. He told of the town of Caryae in northern Laconia, which conspired with the enemy (the Persians) during the Persian Wars in the late fifth century B.C. After the defeat of the invaders the captured women were, according to Vitruvius, tied to pillars and displayed to the city. Later architects use this motif by designing matrons to carry the weight of the tympanum. The Roman way of qualifying and ordering made it possible for the Roman writer Vitruvius – in his book De Architectura (27 BC) – to distinguish three major orders (the Doric, Ionic and Corinthian order). He treats the Tuscan order separately as a local curiosity. The Composite order was added later as a Roman adaptation, which only came to live in the fourth book of the architect-writer Serlio. Christine DENKER NESSELRATH (1990) pointed out that the five-division of columns only became an issue in the Cinquecento (sixteenth century). Any definition of number and sequence of the columns was undecided on in the Quattrocento (fifteenth century). The most pronounced representatives of the latter, like Filarete, Francesco di Giorgio Martini and Luca Pacioli, used terms like Doric, Ionic and Corinthian (types of columns) in a loose way, without a clear understanding of Vitruvius’ original division. Only the work of Alberti (1404 – 1472) gave a correct description of the ‘orders’ and their individual parts (in the fifteenth century). The study of pillars and columns became of prime importance in the Italian Renaissance. Leone Battista Alberti had opened the sequence by miming the style and content of his great Roman progenitors in his book ‘De Re Aedificatoria’ (1485). The book consisted of ten books and the orders were described in meticulous detail. Important, from a number point of view, is his identification of the Composite as a separate order – bringing the total number to five. The Composite order is a more artificial invention of Re-naissance writers than the other four. The status of the various orders started to take shape at the beginning of the sixteenth century, which can be seen at the famous round stairs of the Belvedere in the Vatican, designed by Bramante (fig. 479). Fig. 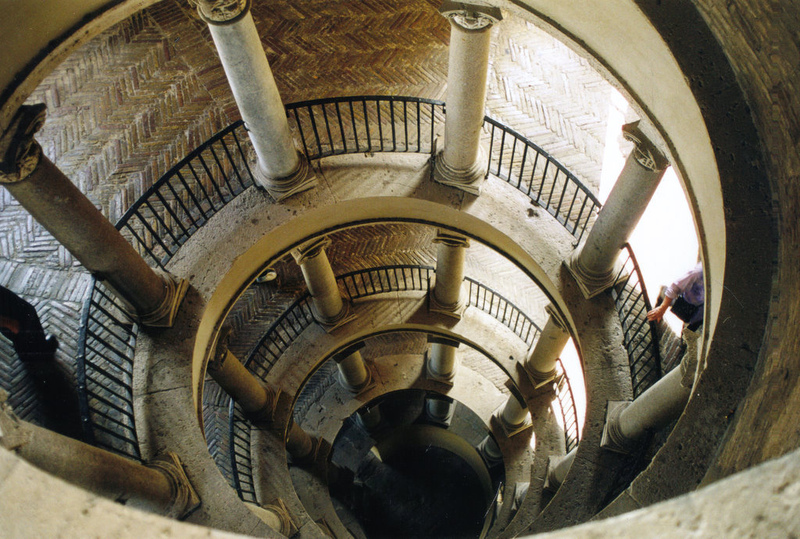 479 – The round stairs of the Belvedere in the Vatican in Rome were designed by Bramante at the beginning of the sixteenth century (1503/1504). Thirty-two columns lined the stairs, representing four different types of column orders: eight Tuscan, eight Doric, eight Ionic and twelve of the Composite order (Photo Marten Kuilman, Sept/Oct. 2000). The first section was probably built around 1504, because the Laokonen Group was brought into the Belvedere in 1506. The earliest document to mention the stairs dated from 1512, when the building of the last part of the stairs was still in progress. The first eight columns were Tuscan, the next eight were Doric, the next set of eight was Ionic and the remaining twelve followed the Composite order. It seems that this superposition was only intended to provide a variety of architectural details rather than a scheme of the classical orders. Sebastiano Serlio (1475 – 1552) in his five-parted Book of Architecture (1537) is the great promoter of the five orders. He produced the first plate ever to show the orders together for comparison. The plate is used as an introduction to his fourth book, in which the orders are described in great detail. The ‘pure’ Renaissance architect Serlio put his mark and extended his influence on a whole generation of architects after him, who showed concern with harmonies and theories of numbers. Full maturity of the progressive concept of the five orders is reached in the second half of the sixteenth century by Giacomo da Vignola (1507 – 1573) in his ‘Regole delle Cinque Ordini d’Architettura’ (1562) and by Andrea Palladio (1508 – 1580) in his four-parted book ‘I Quattro Libri dell’ Archi-tettura’ (1570). Vincenzo Scamozzi (1552 – 1616) published his ‘L’idea dell’Architetura Universale’ a year before his death. The latter writer was the inspirational source for Nicolaus Goldmann (1611 – 1665), known as the ‘Northern Scamozzi’. Goldmann was born in Wroclaw (Poland), but spend much of his academic life at the university of Leiden (Holland). He came up, just like his southern counterpart, with a ‘Universal Theory of Architecture’ (GOUDEAU, 2006/2007). Scamozzi’s special interests in classical orders, housing and the ideal city were repeated by Goldmann, with an emphasis on a modular approach. Remarks on these particular subjects were made in Goldmann’s book ‘Civil Bau=Kunst’ (Wolfenbüttel, 1696; see p. 214, fig. 161) as part of a scientific and universal theory of architecture. This aim is also recognizable in the theoretical considerations of the quadralectic architecture. Robert CHITHAM (1985) gave a description of ‘The Classical Orders of Architecture’. The background of the concepts of ‘orders’, with detailed drawings of the pillars, provides a reference for modern architects (fig. 480). The author did an effort to restore the orders as communication partners in the vernacular of architecture as it is understood today. Joseph Rykwert’s book on the column as an indicator of order in architecture should be mentioned as a useful reference (RYKWERT, 1996). Fig. 480 – A modern representation of the ‘classical’ Five Orders of columns as given by Robert CHITHAM (1985). The detailed measurements give a fixed proportion of 1:3 between the base and the shaft. The proportion between the shaft and the entablature is 4:1. The small figures on the right hand side of the columns refer to these divisions. The various modules of a column are just as difficult to catch in a divisional framework as the classical orders themselves. 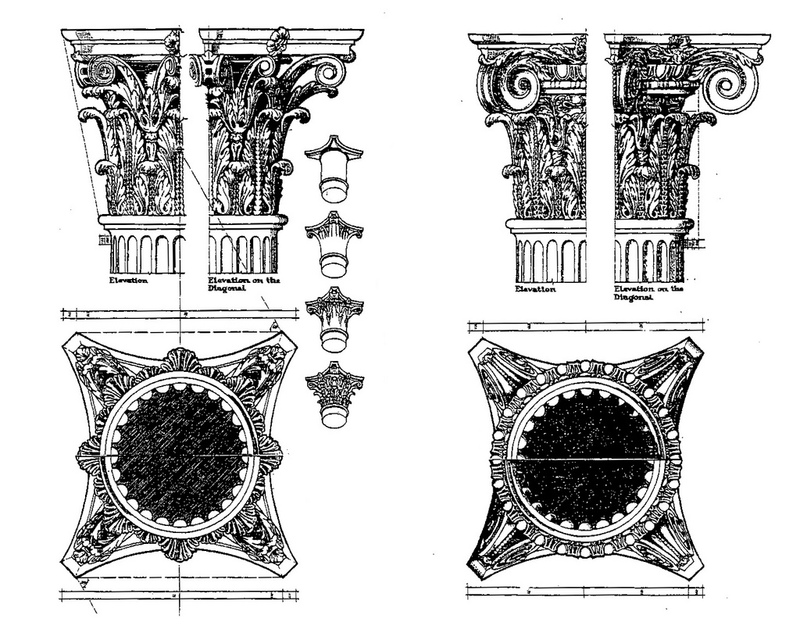 The previous-mentioned elements of a column (entablature, capital, shaft and base) tend to behave in an unpredictable way in their variety and complexity. For instance, the (original) Doric ‘order’, which is supposed to be the oldest (NOACK, 1913), had no base at all. This unit became, in due course, the first elements to evolve during the Geometric period. The Ionic base saw its first development in the sixth century BC in temples such as the Temple of Artemis at Ephesus (ca. 560 B.C.). A square plinth block forms the base and a convex projecting molding, called a torus. Further bickering over the details of the base of columns is left to the specialists, just like the developments of the column shaft. The number of flutes (vertical hollow grooves) varied in the earliest preserved shafts (like the Naxian Oikos on Delos), around twenty. Twenty-four flutes became canonical, in particular in the Ionic and Corinthian shaft. The capital might be – from a divisional point of view – the most interesting part of a column, but the evidence of the arrangement and chronology is, just like the other specifications of the column, often a matter of scientific debate. The Doric capital of the Temple of Athena Pronaia in Delphi had a simple votive in which the circular element is most prominent. Furthermore, the Temple of Artemis at Korkya (580 – 570 BC) and the Old Tholos at Delphi (580 BC; see fig. 76) had (Doric) capitals in which the circular-unity was predominant. 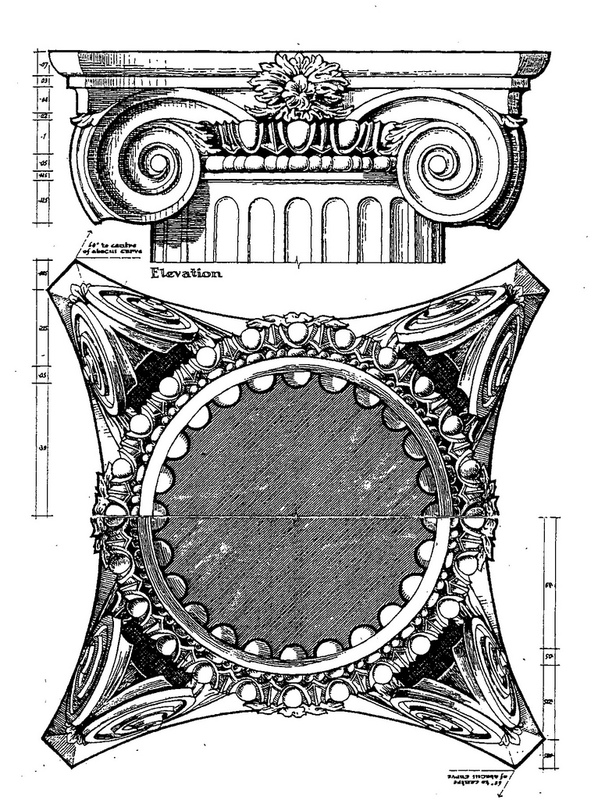 Two opposed volutes (or scrolls) of the Ionic capital were introduced in the (fourth) Temple of Dionysos at Yria on Naxos, breaking the unity of the circle. This division had initially a dual-symmetrical nature, as can be seen at the capital of the Naxian Sphinx Column in Delphi (ca. 570 B.C.). The connections between the scrolls (or canalis = channel) were opened in the capital of the Sphinx Column at Delos (ca. 560 B.C.). The central portion of the volute member is here interrupted by a floral element (fig. 481). Fig. 481 – The Ionic capitals of the Sphinx Column at Delphi (left) and Delos (right) indicate the onset of a further division towards the so-called angle volutes, which project outwards at all four corners. These illustrations, after original drawings by Amandry (1953) and Martin (1973) are given in BARLETTA (2001). Other interrupted horizontal volute members – without a floral motive – are found on Ionic capitals from the islands of Naxos and Paros. Barbara BARLETTA (2001; p. 100) suggested that these (local) differences represent a regional interpretation rather than an evolutionary stage. The volute capital – and the treatment of the echinus in general – showed a considerable variation in its early days of development. However, the transposition from the dual to tetratradic nature of the (Ionic) capital – which might indicate a shift in division-thinking – attracted little attention (perhaps except for the above-mentioned breaking up of the canalis). The actual ‘separation’ must have taken place within the Ionic setting (fig. 482), somewhere in the ‘Renaissance’ of the Greek cultural period in the sixth century B.C. (see p. 108; fig. 74). Additional research on this subject has to be carried out to find a clue. The four-fold nature of the voluted capital was, on the other hand, well established in the (later) Corinthian order and the Romans elaborated on the tetradic theme in the Composite order (fig. 483). Fig. 482 – The canonical Ionic capital has a four-fold nature. The floral element has fully separated the different spirals at the corners. Fig. 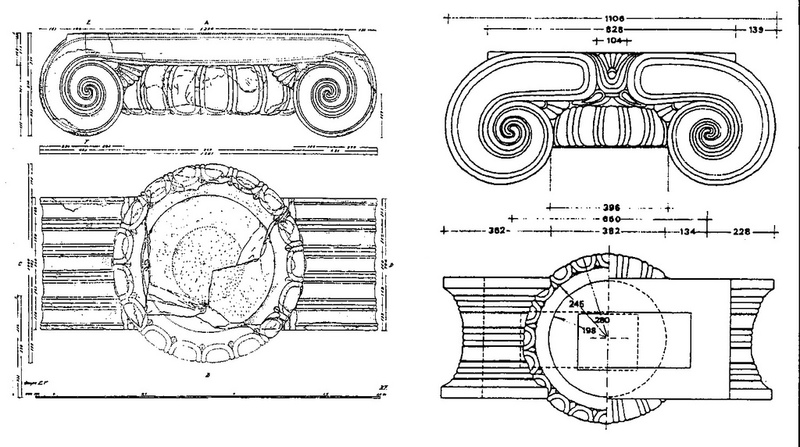 483 – These representations of the upper part of Corinthian (left) and Composite (right) columns indicate a full plan rather than the half-plans (as given by Robert CHITHAM, 1985) to emphasis the tetradic nature of the outlay. Claude Perrault (1613 – 1688) is a representative of the heritage of the (Italian) Renaissance in France. He refined the orders to their most logical and immutable form. James Gibbs (1682 – 1754) published in 1732 a practical textbook on the orders in England: ‘Rules for Drawing the Several Parts of Architecture’. The Scottish architect William Chambers (1723 – 1796) formed with his book ‘A Treatise on the Decorative Part of Civil Architecture’ (1759/facs. 1968) the apogee of the attention to pillars as part of a neoclassicist vocabulary. He elaborated on the principles of proportion with their historical and mythological references. The book was exquisitely illustrated and still remains a magnificent reference to the art of building in the eighteenth century. The interest from a quadralectic point of view is not the number of orders, and neither any specific numerological characteristics. The modular approach has its merits, but it is questionable if the classical architects and builders had such ‘modern’ tools in mind. 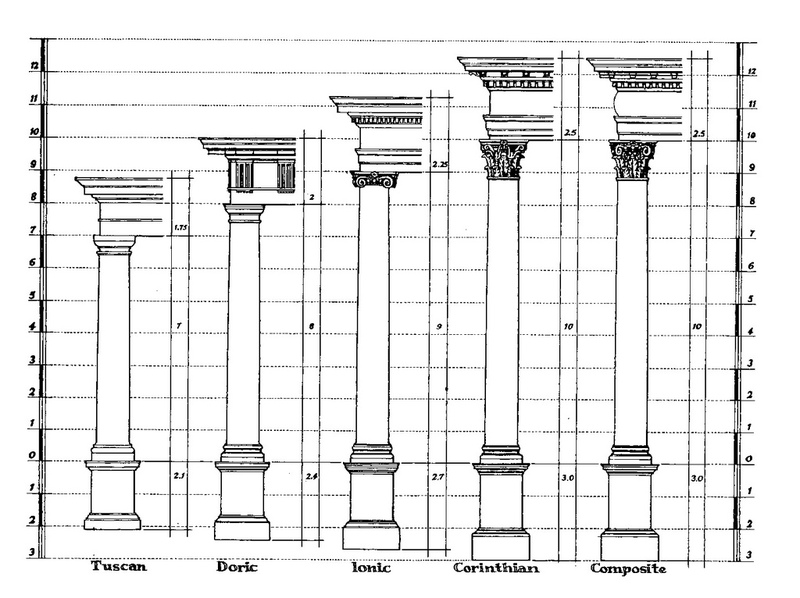 Vitruvius’ reference to a module – as one half of a column’s diameter taken at the base – is one way of giving the columns architectural respectability – but do they really need that? Vitruvius’ association of the Doric (order) with a masculine appearance and the Ionic with a feminine look is a rather subjective observation with roots in a dualistic-oppositional environment. Maybe his epoch-making book (De Architectura, 27 BC) was conceived in the same oppositional setting as its subsequent admirers. A ‘historic resonance’ might be the very quality, which led to its ‘rediscovery’ of the Italian Renaissance. The modern approach to the classical columns has to follow a different route, in which their place in a particular communication cycle is of the utmost importance. This new interpretation means an understanding of the column as a continuity in a (quadralectic) communication-as-a-whole. The structural entity (of a column) travels, as a matter of speaking, through the four quadrants and speaks the ‘languages’ of visibility in the various parts. The meaning of a column can fluctuate in due course, depending on the affirmed position in the communication with a quadralectic observer. This distinction can also be reversed. The characterization of the various quadrants is then used to qualify the ‘orders’, which were earlier – by Vitruvius and his Renaissance followers – determined in a Third Quadrant environment. It has to be realized that the mental procedure, which is followed here, can only take place in a Fourth Quadrant setting and a full understanding of the quadralectic fundamentals. An overview of the full communication is necessary to place the column in perspective. 1. The Doric order (in its Greek version) could be a representative of a First Quadrant state of mind. The harmony of proportions and a dedication to unity and simplicity are in line with the depth of understanding in this quadrant. The majestic temples at Paestum (Poseidonia) in Magna Graecia (south-east of Naples) were created around 500 B.C. and are examples of the (Archaic) Doric order. The Temple of Zeus at Olympia (470 – 457 B.C.) can be regarded as the ‘classical’ representative of the Doric order, just like the Temple of Hephaestus in Athens (see fig. 83). The latter was built in 449 BC and is contemporary with the Parthenon – also with pillars of the Doric kind. The Romans tried to imitate the Doric column in temples such as the Hercules Temple in Cori (100 B.C.) or even ‘improve’ on the Doric by introducing the Tuscan order. Vitruvius mentioned this variant, but its inclusion in the canon of classical architecture of the European cultural period only took place in the sixteenth century (by Serlio and Vignola). This dramatic effort in minimalism can be seen as a further search for unity. This type of columns was widely used in the Georgian style in the United States (New England, Ohio) and have been impiously classified as ‘carpenter’s Doric’, because the columns were relative easy to produce by the builders. 2. The Ionic order would fit in the Second Quadrant because its language ventured in the possibilities of division. It has been stated before that the intellectual setting of the Ionians – living in Greek colonies along the coast of Asia Minor (Turkey) – incorporated the tetradic into their psychological and artistic vocabulary. Their geographical position between the ‘undivided’ (or even better: undecided) Dorian Greeks of the western mainland and the dualistic tendencies of the Persians on the eastern side provided a tension, which brought the four-fold to the foreground. The Temple of Athena Polias at the ‘tetradic’ city of Priene (Asia Minor), situated in the Meander Valley, is an early example of an Ionic temple. The architect Pythius – who also involved in the Mausoleum at Halicarnassus – designed the temple in 334 B.C. Vitruvius used the proportions of the temple as an archetype for the Ionic temple. The city of Priene was divided in four districts, consisting of a religious section (Athena Temple), a political section (Bouleterion and Prytaneion), a cultural part (Theater) and a commercial area (agora) (see also Ch. 4.1.3.4.2, fig. 588). The return of the Ionic order in the Greek Revival architecture in Europe of the early nineteenth century was a new phase of Classicism. The Ionic column of this period adorns courthouses, libraries, banks and public orga-nisations to bring the message of a ‘classical’ trustworthiness (fig. 484). Fig. 484 – A view of the Courthouse of Vicksburg, Mississippi (USA) shows the Ionic columns as major architectonic components. Many public buildings of the nineteenth century featured classical columns in order to underline their religious connections. 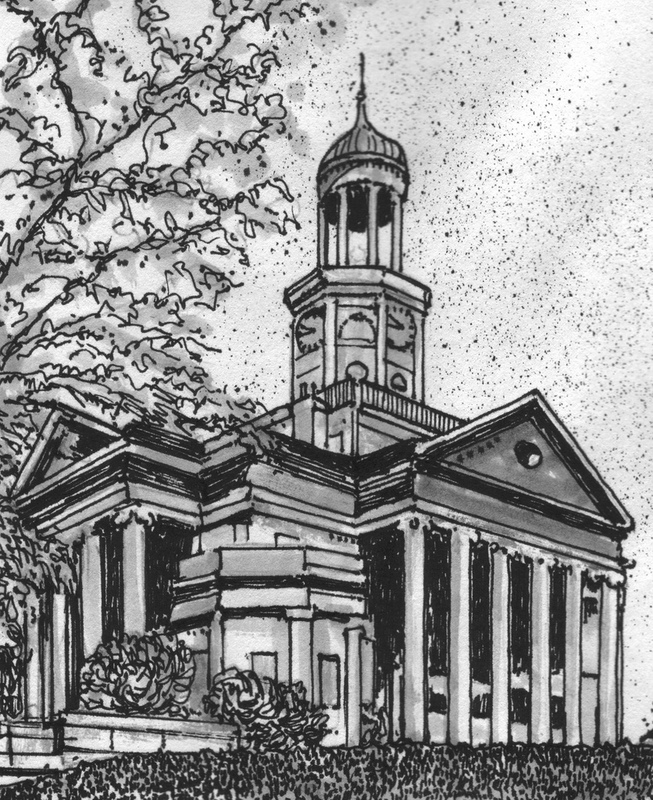 The courthouse was built in 1858. The city of Vicksburg became a crucial place of action in the American Civil War when the Union forces were victorious over the Confederates. The surrender of the latter on the Fourth of July 1863 implied that the city, until recently, never celebrated the national Day of Independence. 3. The Corinthian order, with its pronounced visibility, could be visualized as belonging to the Third Quadrant. The extensive use of acanthus motives was introduced relative late in the development of the capital. The Temple of Apollo Epicurius at Bassae (Phigalia/Arcadia) is credited with the first use of Corinthic capitals. The Doric temple, modeled after the temple of Apollo at Delphi, was built from 420 to 400 B.C. by the architect Iktinos, who also constructed the Parthenon. The frieze of the temple was transported to the British Museum in London, as part of the collecting mood of scientists of the nineteenth century. The monument of Lysicrates, on the western side of the Street of the Tripods in Athens (around 334 BC) is another early example of the use of the Corinthian capital. 4. The Composite order was later added (by the Romans) to extend the range of decorations, in particular of the capital. The order mixed the volutes of the Ionic order with the leaves of the Corinthian order and often added an egg-and-dart ornamentation to the echinus. These intentions would fit in the spirit of the Fourth Quadrant, which aims at a further conquering of visible and invisible possibilities in an environment of higher division thinking. The Arch of Titus on the south-eastern side of the Forum in Rome might be considered as the first example of a Composite Order. It was constructed by Emperor Domitian to commemorate his older brother Titus and the sack of Jerusalem in 70 AD. The arch was completed in 82 AD and acted as a model for similar triumphal arches since the sixteenth century. It is a remarkable lack of historical awareness – or a form of chauvinism – by the Italian architectural historians, who (re)invented the Five Orders in the sixteenth century, to exclude the ‘mediaeval’ columns of their scheme. The decorated pillars of churches of a developing Christianity in Europe, are a class of their own. Their imaginative architecture used the rich stock of Celtic symbolism mixed with Christian motifs. The columns in the cloister garden of Moissac (France) – just to mention one example (SHAPIRO, 1931) – indicate that classical Greek/Roman aspects were exchanged for features of a different geographical background. Four-fold symbolism – like the Evangelists or the four virtues and vices; KATZENELLENBOGEN, 1939) – was part of its vocabulary. The standing stones (see Chapter 3.1) and the Celtic crosses in Britain and Ireland can be added to the cultural contribution of northern Europe with regards to the vertical and elongated in architecture. This chapter on certain elongated aspects of building has to be cut short here, because a further elaboration in this field would lead too far away from the incentives of this book. The upright column – and its symbolic function – has been a major element in architecture for a long time and will probably remain to do so. The pillar, either as a solitary triumphal entity or as a supporting part of a building, will express a message of direction and movement. The upright element (motion) in architecture is independent, but closely related to the initial division. This split (duality) might be the very reason that the number never became a contributing factor in the applications of pillars and columns. The Greek temples in their heydays of Pericles had a disdain for anything numerological. Vitruvius, in turn, did not give much attention to numbers either and his Italian successors of the Renaissance – being more aware of numerology as a means of expression – mixed the classical history on columns together to an order of five, thereby effectively forgetting the ‘monastic’ order of the Middle Ages.